ICQ = "I seek you" - a popular internet IM service provided for free. The first version was developed in 1996 and was introduced as a revolutionary Peer-to-Peer service for sending text messages from a computer to another in real time. By the beginning of the new century it ranked among the best-known IM services with more than 200 million of registered members. IM = Technology for online communication based on chat. For comparison: 1. Chat is online communication via an internet viewer or plugin. 2. IM is online communication via stand-alone programs. Most IM programs (clients) can do much more - the messages can be stored on the server, users can define the font type, insert emoticons, send files and communicate by voice. The best-known clients are ICQ and MSN. IM programs sometimes substitute e-mail or text messages on cell phones (SMS). It is easy to start - just install the client program, connect to the internet and register as a new user. 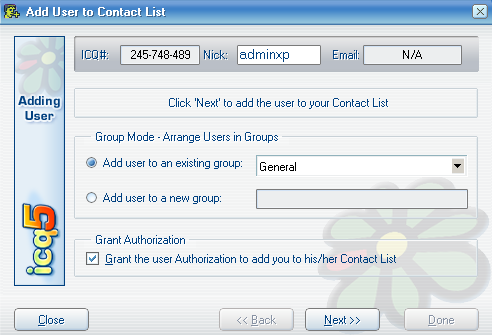 After registration, you are assigned an ID number (UIN), which allows you to log on to the ICQ net. This ID is a kind of a "phone number" for your friends to dial in order to reach you. Three official versions of ICQ for Windows exist: ICQ 5, ICQ2Go!, and ICQ Pro. A comparison of their particular features can be found at: www.icq.com/download/compare.html. Apart from these official clients, one may use different programs provided by other producers, such as IM2, Miranda IM or Trillian. This article is dedicated to ICQ 5 Lite. Besides sending messages, the program provides many other functions, e.g. sharing and sending files, voice communication, including communication via a microphone and webcam. Go to www.icq.com/communication to find links to other OS and platforms. 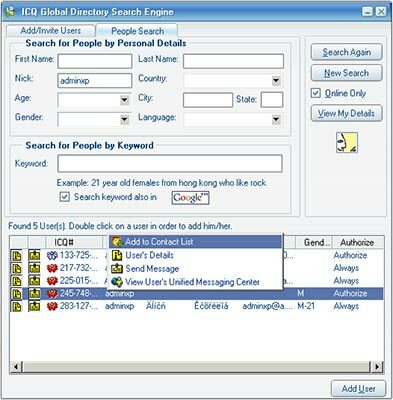 Usage of ICQ on PDAs and cell phones is recommended as well. The installation is very similar to the installations of other programs. After starting the installation, a "welcome screen" appears. Choose the Destination Directory in which you want to install ICQ - if you want to, change the directory using the "Change" button. 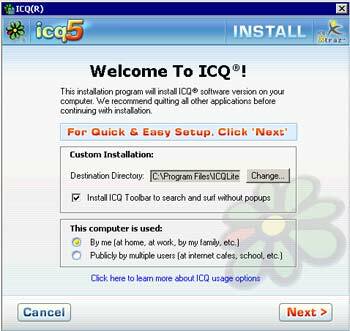 Install ICQ Toolbar - leaving the box checked, the ICQ Toolbar installs into your internet browser. Choose what you prefer. It is usually recommended that you do not install it (upon installation of other programs either). More information at: www.icq.com/toolbar/. Change the option "This Computer is used:". Here you can choose by whom your computer is used. The first option is "by me" - recommended for computers used by one user. The other option is "Publicly by multiple users" - suitable for computers used by more than one user (passwords and history will not be saved). Continue with the Next button. Read the User Agreement. After that, click the "Continue" icon to continue with the installation (copying of files and finishing the installation follow). UIN (Universal Internet Number) - Identification number of an ICQ user. 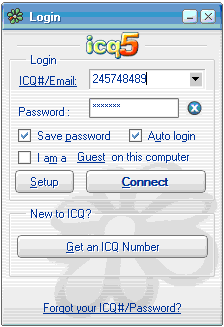 On the logon screen, click the "Get an ICQ Number" button. Follow the instructions and enter the required information. It is recommended that you fill in everything correctly and truthfully in order to be easily identified and found. The disadvantage of this is a partial loss of privacy. In order to protect from SPAM, it is recommended that you check the "Don't publish my email address" box. After a successful registration has been done, write down your ICQ number#. In the "Privacy & Security" settings you may find the option "My authorization is required before users add me to their Contact List" to better protect yourself from unwelcome messages. ICQ starts automatically when Windows starts or when clicking the ICQ icon on your Desktop. In order to use the program, you have to log on. In the logon window, enter your UIN and password and choose Connect. When Autologin is checked, this information will not be required next time. Note that this option is not recommended if your computer and your ICQ account are used by more than one user. The Setup button. The "Using Firewall - Not using Proxy" option is recommended. However, it depends on the type of connection to the internet or the type of used proxy program. If the program still does not work, try to change the port number. For instance, use 23 instead of 5180 or 5190. Adding a user to the Contact List. In order to communicate, the opposite users must be in your Contact List and you must be added in theirs. You can add a user to your Contact List by clicking on the magnifying glass icon with the "+" sign (Add Users). Add/Invite Users - find users you know. Search by number, e-mail, name or nickname. In the bottom part of the window found users will be displayed. After marking chosen users and double-clicking, the adding wizard will start. Using the right mouse button you will open a panel with further options. To add users, double-click on the chosen item/s or click the Add to Contact List or Add User items. You can organize your contacts into groups. Usually the initial option is used. A request to add a user to your Contact List has been sent. The System Notice Panel and the lower right corner announce important events (when the yellow indicator blinks). Just as you have to ask for authorization from other users, they have to ask you to authorize them as well. When you get an authorization request, click the notification. In an opened window, you can confirm the authorization and add the user to your Contact List (Add to Contact List) or to Decline or Ignore the user. Message confirming the addition of a user to Contact List. In order to communicate, just double-click on the chosen user in the Contact List or use the right mouse button and choose Send Message. 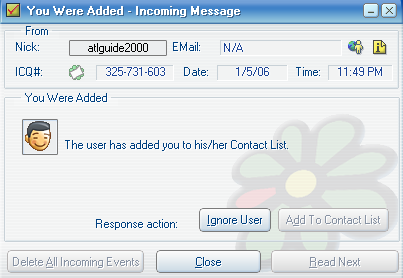 Example of an ICQ conversation - The upper part of the window is designed for the sent messages of both users, the bottom part for typing your messages. Documents and Settings\Username\My Documents\ICQ Lite\UIN\ - if any of your contacts send you a file, a folder is created named after the user containing the transferred data. Disabling the "Welcome to ICQ" welcome screen after the program starts - uncheck the option "Show the "Welcome to ICQ" screen." Closing ICQ on Windows startup is done by unchecking the Launch ICQ on startup item. 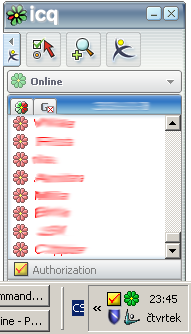 ICQ cannot run on several computers using the same number at the same time. 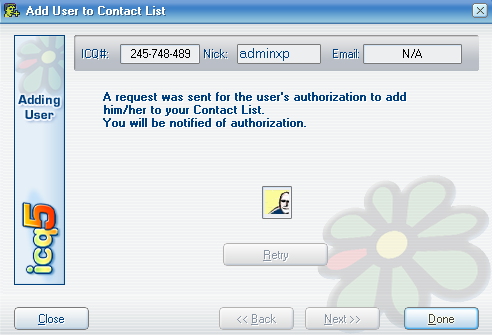 After the logon on another computer, the following message appears on your computer: Your ICQ# is being used on another computer.